There are books in my library I like to re-read every now and again, just to keep certain ideas or techniques fresh in my mind. 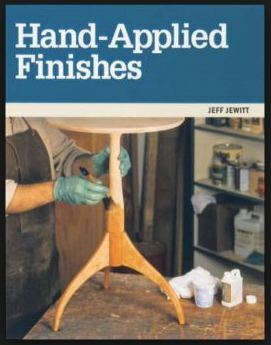 If it has been a while since I’ve started a new project, one of the first books I’ll pull out is Jeff Jewitt’s book, Hand-Applied Finishes. I like to review the dog-eared pages in this book before I even pick out the wood I’m going to use. Why? Because one of the most important aspects of your project is the finish you put on it. It’s the first thing anyone touches. It is the first thing anyone sees (or doesn’t see). It protects your project from abuse and the elements. And, to some degree, the finishing technique you want to use should play a part in determining which species of wood you use (or vice versa, if you’re dead set on using a specific species of wood). One of the things I like about Jeff’s book is that it is easy to read. I don’t just mean the line spacing and page color/composition and slight serif text is easy on the eyes (which it is); I’m also referring to how clearly and concisely he writes. There isn’t a lot of fluff to muddy his ideas and the Contents page gives testament to how well the book is organized. You want to know about varnish? Turn to page 111. Need to control stain penetration? Page 60. Have a finish to repair? Page 169. Each chapter focuses on a different finishing method. Each method is broken down further to (briefly) explain its chemical composition, go over when such a finish might be used, and then describe the best techniques for applying that finish. Most of the images in the book are used to help explain techniques, so I don’t mind that they are in black-and-white. The one exception to this is Chapter 3, which, appropriately enough, focuses on stains and dyes – that chapter does have color pictures. For those of you who don’t ship your finished project out the minute the finish is no longer tacky, the last chapter on maintaining, cleaning, and repairing finishes will come in very handy. Of course, with a three year old running around, the section on repairing finishes still sees a lot of use in our house. Hand-Applied Finishes, published by the Taunton Press, is neither large (standard 8”x10”) nor thick (under 180 pages). It is a perfect reference book for someone like me; that is, someone who doesn’t complete too many projects in a year, doesn’t like messing with spray finishes, doesn’t have the space for a separate spray booth or finishing room, and is always just a little nervous about one of the most important steps in completing your project. It is a highly-used and highly-recommended book in my library.